I mentioned a while ago that Husband has been talking about wanting to get someone in to help us (and more importantly, teach us) after the tykes are born. Through someone he used to work with we heard about Marlene - who I mentally call the "Baby Whisperer". Being open with my plans I of course polled lots of people on their thoughts. It is funny how strongly people feel about the topic (and feel free to post your thoughts in the comments section). My sister Allie thinks it is a waste of money; my mom is okay but probably thinks this is supposed to be her role; Husband's parents don't like to judge about anything so they haven't weighed in. I like to do my diligence and so I asked Marlene for references and called some of them. Cost. I won't share it on this blog but if you want to know how much someone like Marlene costs let's just say it is per day fee and in the hundreds. If you want more info email me at mommy.bostonlaw.esq@gmail.com. Since I get billed out per hour in the hundreds at my job I shouldn't be shocked but I still am. When it came to the cost issue Husband pointed out that we have been saving for many years and what is the point of saving if not to spend it for things that will be useful to you when you need it. It's not like we buy lots of clothes or other items - our biggest expense has been lots of meals out because of our job but obviously that won't be possible for a while. Live-in help. Feels like "Sliver Spoons" or "Benson" (have I dated myself?) to have someone living with you. Our house per typical New England is not big but we do have a second bath (that will be used by the kids) and a guest room. Both references I spoke to were in complete agreement that this was their biggest concern and it turned out to be no problem. If you ask for some time without Marlene she'll give it to you - she is self sufficient and loves to be on her laptop or talking to friends. I also heard she has a big personality so I'll have to be good asking for time for myself. Images of Husband. I will admit that I have been mentally thinking about Husband and I working together to take care of the kids - bathtime, etc. But realistically Husband will take instruction must better from Marlene than he would from me (or my mom). And I know how stressful this time can be - I hope this will help us from snipping at each other. One of the references said she thought it really decreased tension with her husband. Offending Moms. I'm sure my mom would like to think she can "teach" me what I need to know but honestly I have a hard time taking her advice ever. Husband's mom is great and would show me a lot but I can't expect her to be there for a long time and I'd feel guilty about having her up at night, etc. She'll be supportive of whatever we decide to do - even if it seems like yuppy New England craziness to her. So we went for it and hired Marlene for 6 weeks. She does a minimum of a month so initially that is what I was going to ask for but Husband thoughtfully pointed out that it wouldn't be fair to lose the Baby Whisper and Husband at the same time - he goes back to work after a month. Then I'll try to line up some family (like lovely sisters) to come and help out for a few days each. I'm interested in what others thing about our plans, what you did for help, etc. The more controversy the merrier. Maybe I can even get my grandmother to post a comment about how things were in "her day". That's exciting! I can also vouch for Carole Arsenault at Newborn Nurses (http://www.newbornnurses.org/). Carole taught my Great Beginnings class at Isis, and is really wonderful. She was a maternity and infant nurse, is a lactation consultant, and is generally just a wonderful person. She still teaches the newborn care class at Isis. As I'm sure you saw (or will see), we wrote about postpartum help on HDYDI yesterday. If you could deliver early, you know I'm around in August:) or you know for the next set of twins, let's try to have them in June! Dude, whatever you want, HBS and HMS will totally support you. I think it will be nice to have help for 6 weeks. You may grow to feel like you don't need it after 2 weeks, or you may be begging her to stay until they graduate high school. :-) We had my parents here for a week after each of the boys was born. 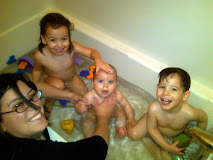 It was good to have extra hands to help around the house or relieve us of kid-duty so we could nap, shower, whatever. Well, you know yourself and you seem to know what type of guidance you'll respond best to. Everyone else will deal. But, if your big concern is breastfeeding, then there are lactation consultants that just come for the day and could fill that need. Make sure you find time even in the early days where it's just the four of you -- you'll want to feel like a bonded family without someone else in the middle. I say, take as much help as you possibly can, even if it means you have to pay for it. But also have some confidence that you and Husband can do this! No one is born a parent, and most people don't FEEL like parents until that little, screaming being (beings, in this case) pops out. Even then, you might not feel like a parent. But you will rise to the occasion and do what needs to be done, I guarantee it. So I hope the decision to use Marlene isn't just one born out of insecurity. I'm sure it isn't, but I wanted to throw some words of encouragement your way just in case. Also, even with Marlene around, don't underestimate the value of having family help. Your concerns about not being willing to take advice from Mom, or getting heaps of unwanted advice from her, I had those fears! And they were unfounded. Mom was great when my little guy was still eating around the clock and only sleeping when someone held him. And she continues to be great with him today. Will Marlene do any housework or cooking for you? That's what I needed most when I was strapped to an armchair breastfeeding all day! I think Allison's right- if Marlene can clean, and maybe even put away Husband's crap that gets left lying all over the place, you'll want to keep her forever. And I would have killed, literally killed anyone, to have a live-in lactation nurse in those first few weeks when Fiona had broken glass in her mouth. PS-"Broken glass" is a highly technical term that describes the feeling I had when new to breastfeeding. But I did survive. You will too.